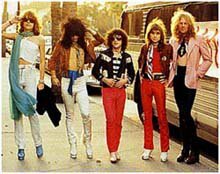 Dave Splash Dot Com: New York Dolls Join the List of Bands that Destoy Their Legacy with a "Reunion"
New York Dolls Join the List of Bands that Destoy Their Legacy with a "Reunion"
According to antimusic.com, the New York Dolls are making a new album in 2006. It will be the first album of new music by the band since its 1974 'Too Much Too Soon' record. The Dolls were a great band, but there is absolutely no reason for this album to be made and/or released. I mean, Johnny Thunders (lead guitar) is dead. Jerry Nolan (drums) is dead. And bassist Arthur "Killer" Kane died last year after the band's "reunion" shows. So the band will be David "Buster Poindexter" Johanson on vocals and Sylvain Sylvain on guitar, along with three unknowns. Was Blackie Lawless busy? * Read the article here. *Blackie Lawless of W.A.S.P. briefly replaced Johnny Thunders back in 1975 for part of a tour when Thunders ditched the band and went back to NYC to score drugs.